James Wellbeloved Duck and Rice 15Kg - A complete dry food with the bonus that it is hypo-allergenic. With duck for protein and selected carbohydrate sources of rice and oats it is a dietetic food excellent for intolerences. We suggest that the food be tried for a period of 3 to 8 weeks. If the signs of the food intolerance disappear continue feeding indefinitely. 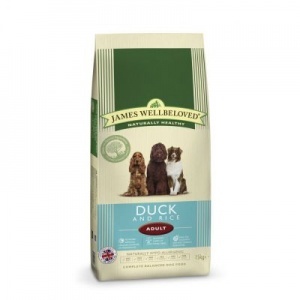 James Wellbeloved Duck & Rice Adult - THE BENEFITS FOR YOUR DOG. Made with natural ingredients with added vitamins and minerals - Hypoallergenic: ideal for dogs with skin or digestive sensitivities. Single meat protein: duck with duck fat and duck gravy- no added artificial colours flavours or preservatives. Excludes the most common causes of adverse food reaction.